STANFORD, CA - What momentum the Blue Devils had after their opening week win against FIU was quickly taken away by Stanford on Saturday night, as the Cardinal cruised to a 50-13 victory. Stanford took control of the game as soon as they touched the ball, with Drew Terrell's early 76-yard punt return TD setting the tone. The Blue Devil offense struggled mightily, picking up just 4 first downs in the first half; the offensive struggles led to a busy night for redshirt-freshman punter Will Monday, who finished with 7 punts on the night, averaging 47 yards per punt. Stepfan Taylor paced the Stanford offense on the ground, totaling 70 yards on 14 carries and 1 touchdown. Josh Nunes effectively managed the Cardinal offense and finished with 275 yards on 16 for 30 passing with 3 touchdowns and 1 interception. After looking vulnerable in the second half against San Jose State, senior LB Shayne Skov returned to lead the Stanford defense to a dominant performance against the Blue Devils. For the game, Duke gave up 373 yards in total offense, and were outgained 27 to 92 in total rushing yards. 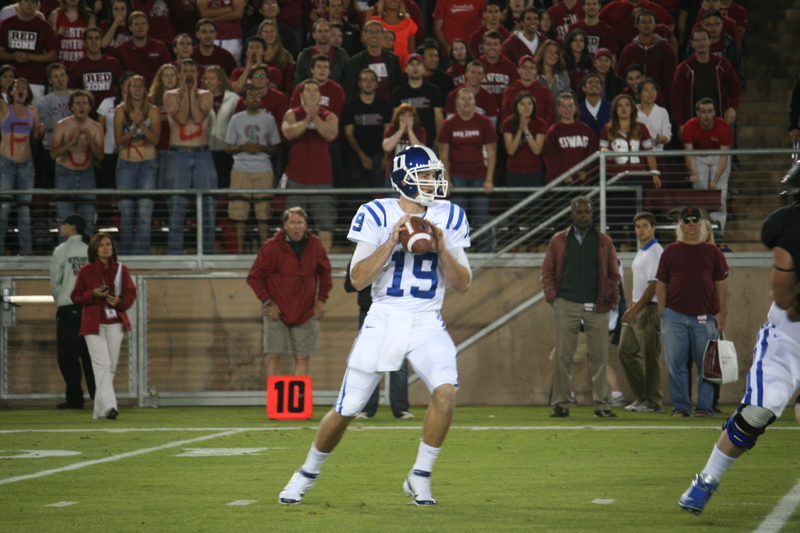 After taking a 23-3 halftime lead into the locker room, Stanford came out and put the game away quickly in the 3rd quarter, going up 37-7 after a Renfree pass was tipped for an interception deep in Duke territory. Renfree's night was over after his second INT was returned 79 yards for the TD in the middle of the 3rd quarter. He finished the game 28-40 for just 200 yards and 2 interceptions. As they did against Stanford last year, the Duke offense finally found the end zone on a drive orchestrated by 2nd string QB Anthony Boone. Brandon Connette muscled his way in from the 4-yard line to cut it to 43-13 in the closing seconds of the 3rd quarter, but it was much too little, too late. 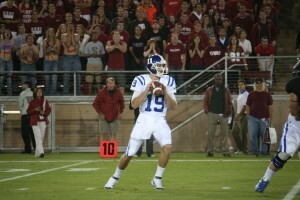 While the Duke offense was sputtering, turnovers kept the game out of reach. Renfree threw two interceptions and Boone added one of his own in the 4th quarter. The little traction that the offense was able to get in the second half was quickly stalled, leaving the Duke defense with their backs against the wall. The Blue Devils added a late fumble to close the game. Though Duke is improved from years past, their margin for error remains slim, and they are unlikely to win games unless they win the turnover battle. After setting a Duke freshman record with 8 rushing touchdowns in 2010, Brandon Connette has continued his red zone success early in 2012. The redshirt-sophomore punched in the Blue Devils' first TD of the game on a 4-yard run and now has 3 touchdowns on the young season. Moving to WR in his senior year, nobody knew what to expect from Desmond Scott. The Durham native has looked comfortable catching the ball in his first two starts this year, as he led the Blue Devils with 11 catches for 83 yards on Saturday. Sophomore Jamison Crowder had a strong second half and finished with 10 catches for 112 yards. It appears that Crowder and Scott have emerged as reliable complements to All-ACC WR Conner Vernon. True freshman kicker Ross Martin looked sharp in his first road game, converting on two field goals of 29 yards for Duke's first points of the night. He's now 3 out of 4 and a perfect on 6/6 on PATs (bad snap not included) for his young collegiate career. The Blue Devil defense gave up just one touchdown in the first half, but a ton of yards of total offense. They held the Cardinal to 3 field goals in the red zone, but also allowed 3 touchdowns through the air. Ross Cockrell had another strong game, picking off Josh Nunes in the 2nd quarter. Walt Canty piled up 9 tackles, including 1.5 tackles for loss, and Kenny Anunike added a sack. Overall, however, the Stanford offense was able to score quickly and often throughout the game. Duke will travel home tonight and begin preparations for the Bull City Gridiron Classic next Saturday night at 7 PM against NC Central in Wallace Wade Stadium.